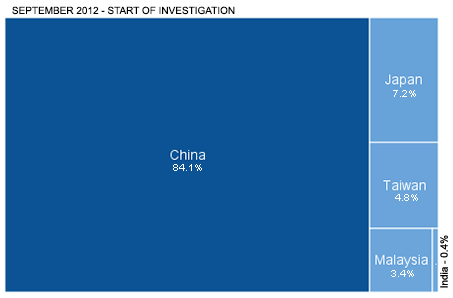 In September 2012 an anti-dumping investigation was opened against Chinese photovoltaic manufacturers. Provisional duties were imposed on these products in June 2013, with final duties imposed in December 2013. For those Chinese exporters which co-operated in the case, the European Commission accepted price undertakings setting minimum prices above which no duties would need to be paid. However, EU producers of solar panels have consistently complained that the measures are ineffective and do not provide the level of protection the findings require. These complaints included a legal challenge, though this was ultimately unsuccessful (more information). Against this background rumours have recently surfaced that the European Commission will open a circumvention case into solar panels exported from four countries: Malaysia, Taiwan, Japan and India. This could result in the highest Chinese duty of 67.9% being extended to all exporters in these countries that are not granted an exemption. To assess whether the data would support a circumvention case, we analysed the import trends of all four of the possible countries following the opening of the original investigation, and compared this to trends in China’s exports of the affected tariff headings. In our opinion, Malaysia and Taiwan are likely targets for a circumvention case, while India and Japan are far less probable. To illustrate how much trade patterns have changed, we have included graphs showing the percentage of total exports of solar panels from China and the four rumoured circumvention targets each country accounts for. The total value of exports has halved during this time, but the value of exports from Taiwan has doubled, and exports from Malaysia and India have nearly tripled. Japan’s exports have decreased, although the large reduction in Chinese exports means that export share has increased despite this. In our opinion, the data supports a circumvention case, should the Commission believe one is warranted. Posted in Circumvention, Solar Panels. Copyright Trade Customs Compliance Consultancy Limited 2006-2015. All rights reserved.